Rejoice, thou who prayest for us; Rejoice, our fervent Intercessor! Rejoice, O Most Pure, for from Thy icon mercy pours forth upon us. 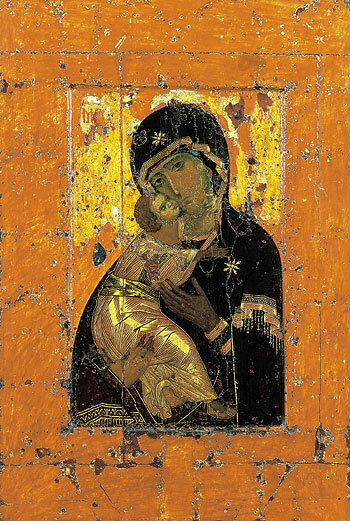 in honor of Her Vladimir IconThe histories of Moscow and of the icon of Vladimir Mother of God are eternally inseparable. How many times did the Mother of God save the capital city from enemies through the grace of her holy icon? This icon has linked Apostolic times to Byzantium, Kievan Rus’ to Vladimir Rus’, and later to Muscovy, the Third Rome; as it is said, “there will be no Fourth.” The kingdom of Moscow was formed by divine providence and embraced the mystical ties of ancient empires, historical experience and traditions of other Orthodox peoples. The miracle working Vladimir icon became a symbol of unity and succession. Words cannot describe this icon; any verbal expression would be hollow compared to the gaze of the Theotokos from her image. This look contains everything – life and death; resurrection, eternity, immortality. According to ancient tradition, the Holy Evangelist, Physician, and Iconographer Luke painted three icons of the Theotokos. When the Most Pure One looked at them, she said: “May the grace of the One Who was born of me, and my grace, be with these Holy Icons.” One of these Icons is now known as the Vladimir icon. This depiction of Our Lady was kept in Jerusalem until 450 AD, after which it was taken to Constantinople. In the first half of twelfth century Luke Chrysoberges, Patriarch of Constantinople, sent the icon (together with the other image of Theotokos, known as “Pirogoschaya”) as a gift to Grand Duke Yuri Vladimirovich Dolgoruky, who placed it in the Vyshgorod convent (near Kiev), an area once belonging to Equal-to-the-Apostles, Grand Duchess Olga. In 1155 Vyshgorod became a possession of Prince Andrew, son of Yuri Dolgoruky. When prince Andrew decided to return to his homeland in Suzdal, he took this Icon without his father’s permission. As he traveled, he continually served molebens before it. The people of Vladimir-on-Klyazma met their prince with joy. Afterwards the prince wanted to continue on to Rostov, but six and half miles from Vladimir their horses stopped near the Klyazma River, and refused to go any further. Even newly harnessed horses refused to proceed. The astounded Prince Andrew fell weeping in front of the Icon and prayed. Thereafter the Theotokos appeared to him with a scroll in her hand, and ordered to leave Her image in the city of Vladimir, and to build later a monastery on the place of her appearance in honor of her Nativity. 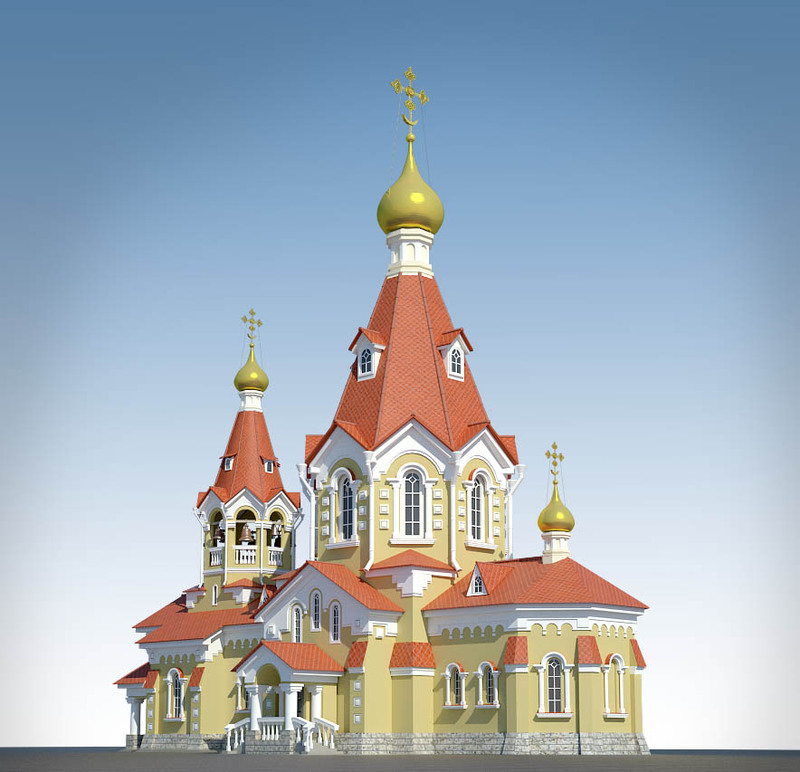 Prince Andrew left the icon in Vladimir, and since 1160 it has been called the “Vladimir” icon. In 1164 Prince Andrew Bogolubsky took this Icon on his campaign against Volga Bulgarians. After the prince went to Confession and took Communion, he prostrated before the image of Theotokos, and said: “All who put their trust in Thee, Our Lady, will not perish!” All the soldiers followed their prince to venerate with tears the miraculous icon, and went to battle with trust in the aid of the Mother of God. The infidels were defeated. A moleben was served before the holy icon after their victory on the battlefield. A miracle occurred during the prayer of the Russian soldiers–a light from the icon and from the Holy Cross illuminated entire area. On the other side of Christian world, at the same time and on the same day, the Byzantine Emperor Manuel saw the light of Christ’s Cross, and, being encouraged by this sign, triumphed over Saracens. After Prince Andrew and the emperor of the Second Rome related their experiences to one another, the Feast of the Procession of the Precious Wood of the Live-Giving Cross of the Lord was established on the first of August. This feast is also called the “First Feast of the Savior” by the Russian people. Many other miracles were revealed through the wondrous icon. In 1395, Tamerlane with his Tartar horde approached Moscow. Christians had only one hope—in God’s help. The Grand Duke of Moscow, Vasiliy Dmitrievich, requested that the icon be carried from Vladimir to Moscow. The procession from Klyazma took ten days. People stood on their knees all along the road upon which the procession passed, and, stretching out their hands, begged: “O Mother of God, save the Russian Land!” The city of Moscow waited solemnly for the Vladimir Icon. All the city’s clergy took part in the procession. The Duke’s family, boyars, and common Moscovites came outside the city walls to Kuchkovo fields to meet and accompany the icon to the Dormition Cathedral in the Kremlin. The grateful Muscovites built the Sretensky Monastery on the site of the meeting of the miracle-working icon which took place on August 26, 1395, “That the great works of God may never be forgotten.” After remaining for 242 years near the Klyazma River, the Vladimir Icon of Theotokos was taken to Moscow and placed in the Kremlin Dormition Cathedral. Thanks to its grace-filled protection, Moscow was spared in 1408 from Khan Edigey, in 1451 from the Nogay prince, Mazovshi, and in 1459 from his father Khan Sedi-Ahmet. In 1521, the khan of Kazan, Mehmad-Girey, advanced toward Moscow with Kazan and Nogay Tartars. Metropolitan Varlaam prayed with the people before the Vladimir Icon. Grand Duke Vasiliy Ivanovich barely managed to gather enough soldiers to meet the Tartars at the kingdom’s border, near the Oka River. He was slowly retreating to Moscow, trying hard to hold ranks. On the night of the siege, a nun from Ascension Monastery (in the Kremlin) saw the holy hierarchs coming through the closed doors of Dormition Cathedral, carrying the miracle-working Vladimir Icon. These were saints who had lived two centuries earlier–Metropolitans of Moscow Peter and Alexei. She also saw how their procession was met by Saint Varlaam of Hutyn (near Novgorod) and Saint Sergius of Radonezh, near the Tower of the Savior in the Kremlin wall. They prostrated before the icon and pleaded the Most Pure One not to abandon the Dormition Cathedral and the people of Moscow. The Intercessor then returned through close doors into Cathedral. The nun hastened to relate her vision to the citizens of Moscow, who gathered in the church for a heartfelt prayer. The Tartars again saw a vision of “a huge regiment in shining armor,” and ran away from the walls of the city. Thus, the people’s prayers before the Vladimir Icon have saved the Russian land many times. To commemorate these events, the following feast days were established: May 21, in honor of Moscow’s deliverance from Crimean Khan Mehmad-Girey in 1521; June 23, in honor of Moscow’s deliverance from the hordes of Khan Ahmet in 1480; and August 26, in honor of Moscow’s deliverance from Tamerlane’s army in 1395. One version of the Vladimir Icon bears the special name, “Tree of the Muscovite Nation.” The first of these Icons was painted during the sunset of ancient Russia, in 1668, by the royal iconographer Simon (Pimen) Ushakov, for the Holy Trinity Church at Nikitniki near Kitay-gorod. This icon depicts Saints Peter and Alexis watering a tree growing out of the Kremlin walls; the branches of the tree bear icons of Russian saints, and at center is an oval image of the Vladimir Mother of God. Another icon, called the “Laudation of the Theotokos” depicts Old Testament prophets with unfurled scrolls, upon which are written words of the Akathist to the Mother of God. The “Tree of the Muscovite Nation” icon similarly shows the heavenly protectors of Russia, who glorify and praise the Most Pure One, and pray to her to protect the Russian land. Today the city of Moscow is radiant for it receives the sunbeam of thy wonderworking icon, O Lady. As we greet it we pray to thee and cry: O wonderful Mother of God, pray to Christ our God Who was incarnate of thee that this city and all cities and countries be kept safe from all enemy assaults and that our souls may be saved, for He is merciful .